I saw your post earlier when I was just starting to make sample blocks of Aircrete. So I cheated and asked a friend to make a spreadsheet for concrete amounts 10lbs and under since this part can be a bit tricky. The batch recipe used for batch number 1 was 5.22 LBS Portland CPC-30R, 3.22 LBS water and 1.56 LBS foam. Hi, i am new to this site but very interested in aac and have been for quite some time. Can you inform me as to the dimensions of your molds (LengthxWidthxHeight)? I am sure that maximizing the surface area of the pour will make for better drying times. This can be achieved with smaller pours into the same mold over a few days? I do not own a machine but you do! If you would not mind i would love to use you to collect data while you perfect the mixture. @Ben Just want to verify that you understand the difference between materials. Here is AAC explained, "Autoclaved aerated concrete, or AAC, is concrete that has been manufactured to contain lots of closed air pockets. 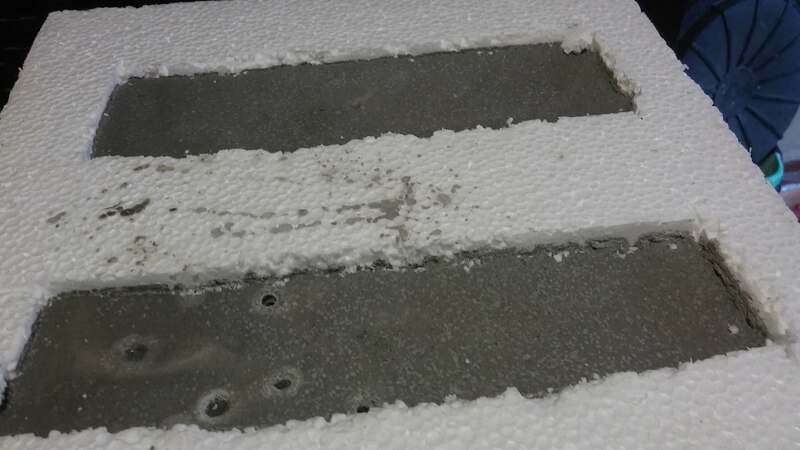 Lightweight and fairly energy efficient, it is produced by adding a foaming agent to concrete in a mould, then wire-cutting blocks or panels from the resulting ‘cake’ and ‘cooking’ them with steam (autoclaving)." There is no "cooking" with aircrete, instead, you will need a powerful air compressor for efficient foam production in bulk, because a 1HP, 5cfm cannot do the job efficiently. Just throwing that in there so nobody wastes their precious time...Foam sweet foam! @dalhface o i am aware, iv been obsessed with it for a few years, mainly as a boat hull material. @dalhface the real issues i have are with planning and zoning accepting these concepts as a viable housing situation. My solution is to instead build a boat. it may never move, it may be a lousy performing boat but it will be habitable while it waits for the water. @Ben I imagine that your boat will probably be kept upside down while you are building it, and attached to a suitable slab to keep it steady while you work on it. Great idea.